Yes, this is an old picture from last year. I couldn’t get one yesterday because I was out of storage on my phone. 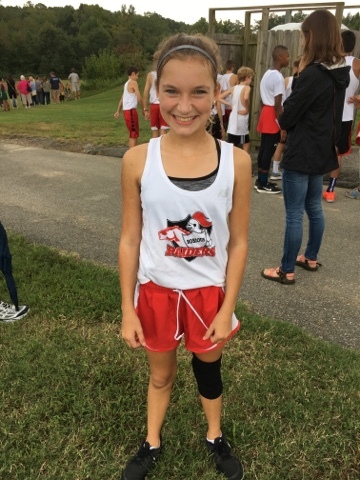 Yesterday was the first cross country meet of the year. Always a nervous day, and she was running with an injury. I was pleased to see that the worries that plagued her last year were gone, and in their place a confidence that can only come with experience and success. She’s still not the fastest, but she’s not the slowest, and neither matters because the only one she has to prove anything to is herself. Super proud of her yesterday. Beyond words proud. I found a vantage point on the course to cheer her on. Once she passed me, I moved on to the next spot where I would see her. (I firmly believe in cheering my kids on at the top of my lungs. In my own experience, I know a well-placed cheer at a tough spot on the course can make all the difference. Either my kids don’t mind or they’re too polite to tell me to stop, so I keep yelling.) As I walked away, I turned to see if I could still see her from a distance. There are a lot of brunette pony tails in white singlets so it took me a minute to find who I thought might be her. This particular brunette ponytail ran past a teammate who’d gone out too fast and was walking, and as she did, she turned around and spoke to the girl. Then she slowed her pace to a walk to match the girl’s stride and momentarily the two of them took off together. Then brunette pony tail pulled ahead and disappeared over a hill. After finishing probably her fastest race yet, and having just lost to a teammate with whom she’d been neck and neck, and having just been thrown up on by another runner, she collapsed against me. I congratulated her on how well she did. And then I asked her a question. One I suspected I knew the answer to. Not one mention of her time, not one regret that if she didn’t stop maybe she would have done even better and maybe even have beaten the teammate. All those things are important to her, but not as important as being kind. The only one she has to prove anything to is herself.